The Supermicro A1SRi-2758F is perhaps one of the more highly anticipated platforms of the last year. It combines an 8 core Intel C2758 series Rangeley processor with a platform that is built to handle more workloads than any previous generation Atom. The onboard 8-core C2758 we have found to be many times faster than previous generation Atom processors. The Rangeley C2758 trades Turbo Boost for QuickAssist. Other than performance, Rangeley is expected to have a much longer production run as it is meant for embedded Telecom customers. 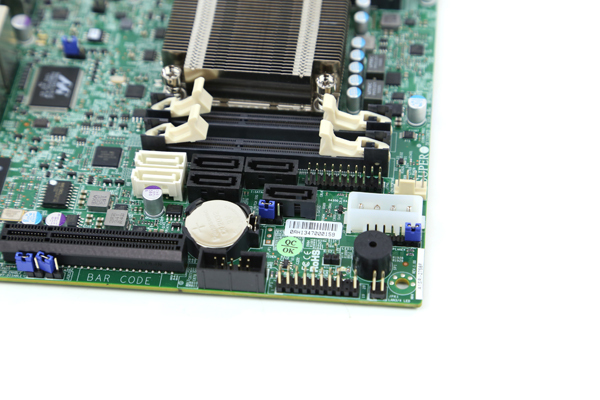 The platform is largely similar, save the processor, to the Supermicro A1SAi-2750F we reviewed in October 2013. 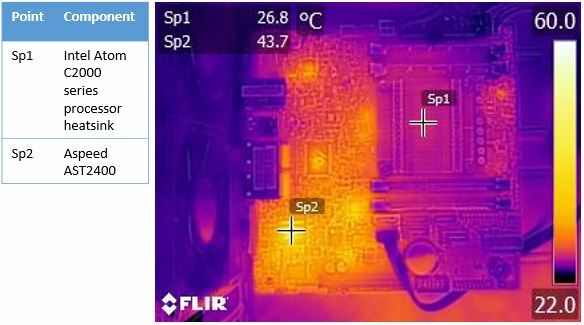 Oh, and as a teaser, this is officially our first review with FLIR imaging so readers can now see what kind of cooling is required for these platforms. Overall, both memory configurations worked well. 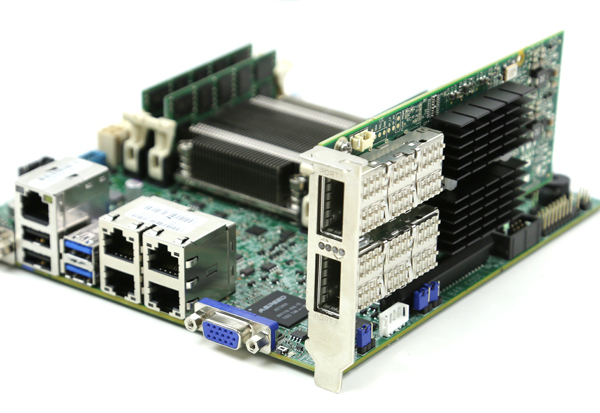 We also had additional time with this review so we were able to test add-in cards such as a Mellanox ConnectX-3 VPI Infiniband/ 40GbE card with the motherboard. The combination of the onboard NICs plus the 40GbE/ FDR Infiniband networking was impressive to say the least. 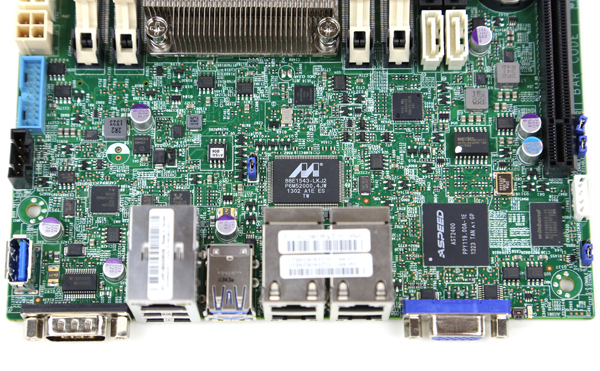 The Supermciro A1SRi-2758F is a very compact server motherboard. It utilizes the mini ITX form factor. That means it is approximately 6.75″ by 6.75″ and makes most standard ATX and larger motherboards look enormous in comparison. Here is a shot with the heatsink removed so one can see the very small CPU package. These motherboards have fixed processors, so there is no large socket mechanism and the processors are not replaceable (or at least “easily” replaceable.) Overall, this is a densely packed motherboard and the lack of a socket helps in this regard. It is also a contributing reason that we see four memory slots in most mini ITX Intel Atom C2000 designs. Unlike our Supermicro A1SAi-2750F sample, the A1SRi-2758F came with the standard passive heatsink. Realistically, the Intel Atom C2758 is a 20w maximum TDP chip so with the generously sized heatsink there is a fairly minimal airflow requirement. Thermals are excellent even with minimal airflow due to the low TDP of the parts involved. Since the Rangeley platform is very well integrated, this small mITX platform comes pre-installed with virtually everything needed for a working system. One major required component are the DDR3 SODIMMs that the motherboard takes. Kingston sent eight of their 1.35v low power 8GB DDR3-1600MHz ECC memory modules for our testing. One thing that we certainly noticed was that our ECC SODIMMs worked with the motherboard while standard non-ECC SODIMMs were causing issues. The bottom line here is to check manufacturer compatibility lists and use ECC SODIMMs with these server platforms. The top of the motherboard there is a standard 24-pin ATX power connection and a 4-pin CPU power connector. Other very interesting features are both a front panel USB 3.0 connector along with an internal Type-A USB 3.0 header. This is a major upgrade to previous generation Atom (and even Xeon) platforms as it allows for fast USB 3.0 sticks to be added inside the server chassis. Perfect for boot images. It should be noted, several other Intel Atom C2000 series platforms do not have USB 3.0 ports so this is a significant point of differentiation. The Marvell Ethernet transceiver sits just behind the quad Gigabit Ethernet ports. It is one of the key components to get the Avoton / Rangeley quad Intel i354 NIC working. This is considered the “premium” LAN configuration as some manufacturers have gone a less expensive route and integrated lower-end Intel i210 controllers. The key to getting the Intel i354 gigabit network controller working is having the appropriate Intel (not Marvell) drivers. New OS versions such as CentOS 6.5 and Ubuntu 13.10 have the new igb drivers in the basic installation. Older OS versions will likely require drivers from Intel. Other distributions such as pfsense are working to get drivers to their distribution using the A1SRi-2758F as a development platform. The bottom side of the motherboard had several interesting features. We see the ASpeed AST2400 chip displayed prominently which runs the BMC for IPMI 2.0 functionality. The two white 7-pin SATA ports are SATA III 6.0gbps ports while the four black 7-pin SATA II ports provide additional storage flexibility. Overall, six onboard ports is ample for many applications. One other interesting feature is a 4-pin molex connector so that a hard drive can be powered directly from the motherboard. In theory, one can have an entire system powered solely by the ATX power connector. As for PCIe connectivity the Supermicro A1SRi-2758F has a PCIe x8 slot. This gives the platform a lot of flexibility in terms of being able to add additional controllers. We tested using both the newer LSI 9300-4i4e card, 9207-8i, and 9240-8i HBA/ RAID cards and they worked fine. 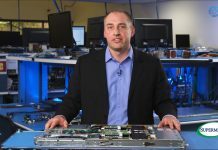 Moving to a 16 port card would provide 22 drives worth of connectivity along with the platform’s existing quad Ethernet solution. 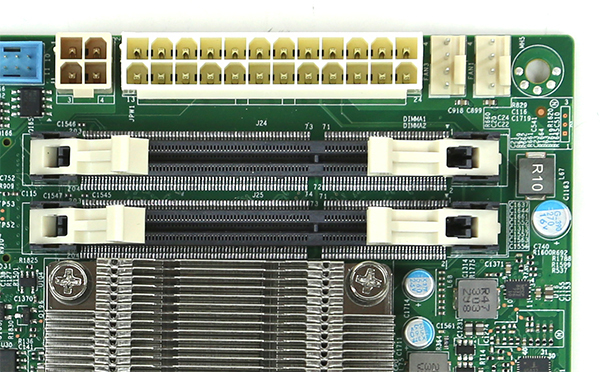 We also utilized our Mellanox QDR and FDR Infiniband cards in the slot successfully (see above.) Unlike the previous generation Atom S1260, the new Avoton / Rangeley platform is much more robust and having an extra PCIe x8 slot adds much flexibility to the platform. The rear I/O panel follows the standard Supermicro X9 and X10 series I/O panel design. 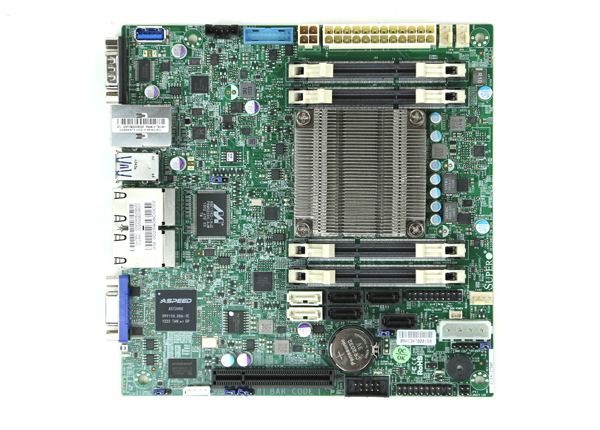 One can, for example, see a similar layout in our Supermicro X10SL7-F review. There are legacy VGA and serial ports. Peripherals can be connected using two USB 3.0 and two USB 2.0 ports on the rear panel. Networking is provided by a dedicated IPMI port (above the USB stack). The quad Intel Ethernet ports can be found on the rear panel as well. The Intel Atom C2758 has a quad port Intel i354 gigabit controller built-in. The built-in Rangeley MAC is a 4x 1GbE/ 2.5Gig Ethernet design so this is essentially a high-quality built-in quad port NIC. From those ports the general decision manufacturers must make is to connect them directly to a chassis switch chip or use a Marvell based PHY. Supermicro utilizes the 1GbE Marvell chip as we saw in earlier board shots. Another important feature is the ability to remotely mount CD images and floppy images to the machine over the dedicated management Ethernet controller. This keeps maintenance traffic off of the primary Intel NICs. At the same time it removes the need for an optical disk to be connected to the Supermicro motherboard. Combined with the onboard Type-A USB 3.0 header, mounting OS installation or recovery images remotely is a very simple affair. 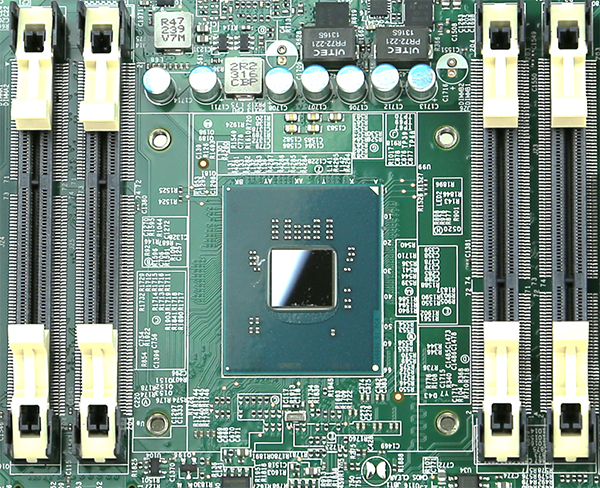 Overall, the Rangeley based Supermicro A1SRi-2758F is poised to be a very popular platform in 2014. 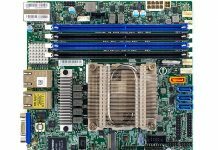 The opportunities for both the Supermicro A1SRi-2758F here and the A1SAi-2750F we reviewed previously are much expanded due to the new Rangeley/ Avoton architecture. We already looked at the performance of the platform reviewed here and it was very strong. 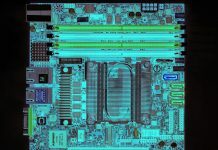 As we look to update our colocation infrastructure, this Rangeley motherboard is certainly being tested to use in roles ranging from a firewall appliance to a load balancer to even a primary web/ virtualization server. Too bad it does not have vt-d =((. Hopefully Intel will enable this on future generations. I’m going to guess that camera cost a pretty penny. Great review though and fantastic to see the heat generated by the board. Have you been able to confirm if the ethernet ports actually support 2.5Gbps? A total unreliable crap. It failed working after 20h of operation. Is there any simliar board like this, tiny, lots of ethernet ports, lots of RAB capability, Vt-d. Integrated processor or not– that thats good for VM enviroment? hi’ve just bough two a1srm 2758 pretty similar to this board, but have up to 64GB RAM, 1pcie 2.0 8x open ended, 1pcie 2.0 x4, and is mATX sized. i also bought 2 mallanox cx354a-qcbt connectx-3 vpi dp 40/56gbs. have you any idea wtf ? how have you made youre card working during ” additional time with this review” ?